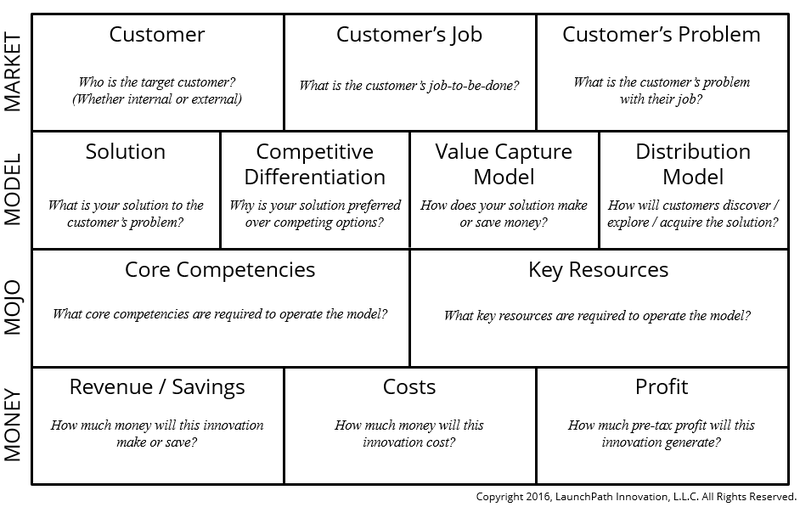 The 12 components of any individual business innovation. A co-worker has a brilliant idea for a product that could generate millions of dollars. No An innovation is a change – not just an idea. A new sign in the break room reduces coffee waste by 5% Yes This is intentional, positive change. The company creates and deploys a new product, but it proves to be a market failure. No This change was not positive. IMPROVE – These are innovations that improve the efficiency and effectiveness of current business operations. EXPAND – These are innovations that expand or extend the market reach of current lines of business. For example, let’s say your business is a hot dog stand. An improve innovation might might consist of better advertising that attracts more customers or a better chili recipe that improves customer satisfaction and retention. An expand innovation might consist of a line of kosher hot dogs or vegetarian hot dogs that allow you to serve a new market segment. A create innovation might be a subscription-based lunch delivery service that delivers a healthy lunch to your office daily for a monthly fee. When working with your colleagues to develop, evaluate, and implement innovations, draw on these simple concepts to facilitate more effective communication and collaboration.